When flying first class, you expect a more comfortable and convenient experience. Why can’t you have that same feeling with your mortgage process? From first contact to closing, everything we do is First Class. Locally-owned and operated out of the Midwest, you will receive the highest level of customer service and industry experience. We know our clients’ names as well as their credit scores. We encourage questions. We listen. We act. We’re your trusted friend in the business. Our five-star Google reviews and appreciative testimonials are no accident. With over 100 years of combined experience, our team is dedicated to satisfying our customers with a quick and easy loan process, constant communication and friendly interest rates. At our branch locations in Fargo, Grand Forks and Maple Grove, the First Class Mortgage process ensures quick and hassle-free home financing for first-time homebuyers and refinancers alike. We partner with your real estate agent and a credit union to establish a timeline. We shop multiple lenders to find a loan with the lowest rates and affordable terms. First Class Mortgage works with customers of all asset and income levels, from FHA financing to Jumbo loans. Want to learn more about First Class Mortgage? We’d love to meet you! Contact us today to get started. **First Class Mortgage II, Inc. is currently licensed to do business in North Dakota, South Dakota, Minnesota and Montana. 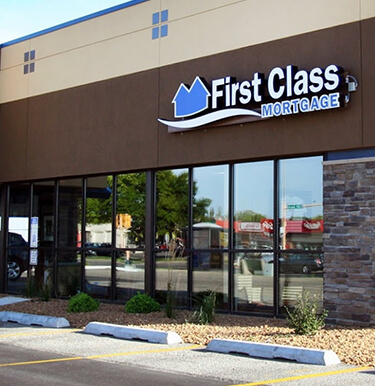 **First Class Mortgage III, Inc. is currently licensed in North Dakota and Minnesota. **First Class Mortgage V, Inc. is currently licensed in Minnesota, Wisconsin and South Dakota. With offices located in North Dakota and Minnesota, our mortgage lending team is available to answer any questions you may have and much more. Focused on making a difference for clients, team members and our community. Don't take our word for it; see what people are saying about First Class.